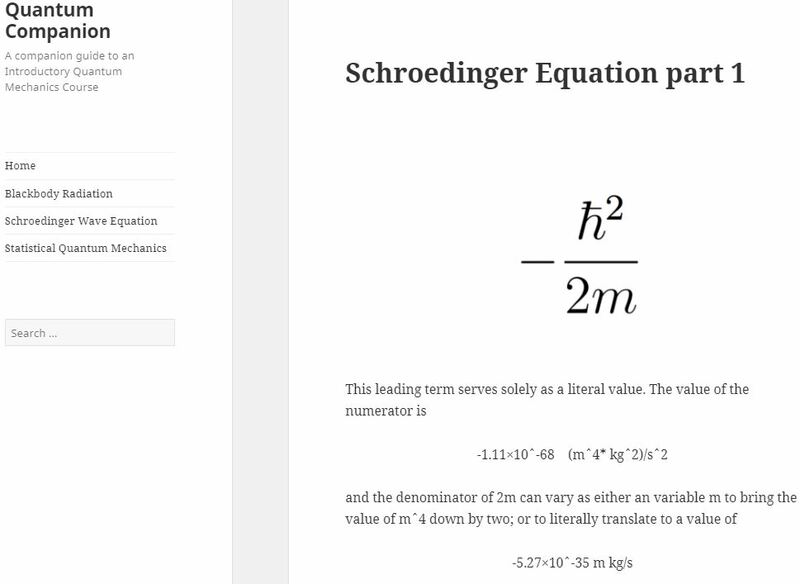 The material that is covered and encompassed in an introductory quantum mechanics course can prove to be daunting and impressive to new comers. This is alleviated by endless class discussions and hours digging through stack exchange after stack exchange looking for further explanations. A central resource for related course material could serve as both a time saver and an interest promoter. Through some programming, the hope was to create a standalone mobile application for use in accessing this cache of materials. Utilizing online HTML seemed to be the most straightforward approach in incorporation of this material for multiple platforms. Materializing all of the resources necessary to go through a course in quantum mechanics is a very relative goal, so creating space for at least the main concepts served as the most attainable goal. I was able to partially succeed in doing this, though not to the full extent than had predicted during the introductory stages. A selection of these course topics was made after some discussion among fellow members of this introductory course. Spacing out topics covered and going over a few that were not discussed in depth served as a more than daunting task. The shear amount of information present lead to a thinning of topics, and an emphasis on the ones more visually appealing to discuss. In the development of this course companion, I consulted several members of the Vassar CS department to coordinate the application of several action-related components of my proposed code. After several de-bugging sessions, I was able to integrate this into an independent URL and I later stored databases through WordPress. I had also intended to provide some real-time walk though examples of some selected topics, but the production aspects of these films proved very low after I attempted to use equipment loaned out through media resources. These screenshots serve as representations of a single line of inquiry for the project. A multitude of others are programmed in, but are not represented here. The first beginning page of the collection starts with a brief introductory statement of purpose and is framed by a list of available resources discussing several of the topics. Each of these pages offer a brief representation and provide more links to further expand into detail depending on the total variables present in the equation. First Equation example. These pages are represented for components of equations. The culmination of this project resulted in less than my initial projections . Keeping with the entirety of a course subject on a single page is, as I’m sure any instructor knows, quite the task. Even with weeks of time leading up to the execution, creating realistic goal timelines, and collaborating with more experienced programmers; this was a tall order to fill. The finished product of all of these hours of effort and error resides at QuantumCompanion.xyz . I hope stands as a strong representation of the time and commitment to this cause. 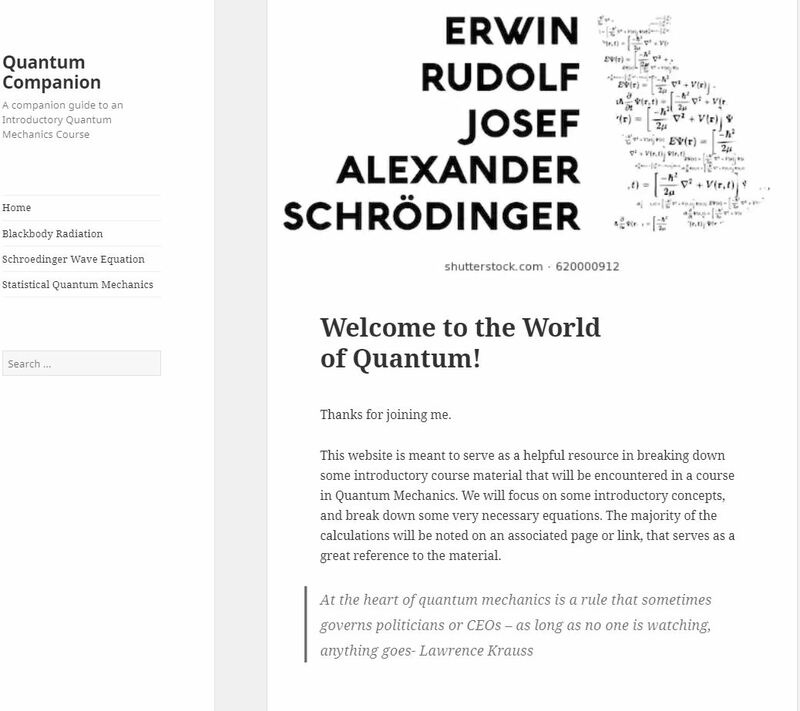 If I were to recreate this quantum site again, I would spend less of my time focusing on the programming side of the project. A significant portion of my time was squandered pouring over code instead of building better content. In the future, I would like to expand on this idea of a cumulative website and include more original content. Having video presentations, I feel would also add to the overall effectiveness of the site, and, given another attempt at using recording equipment, I would hope to deliver on this aspect of the project. 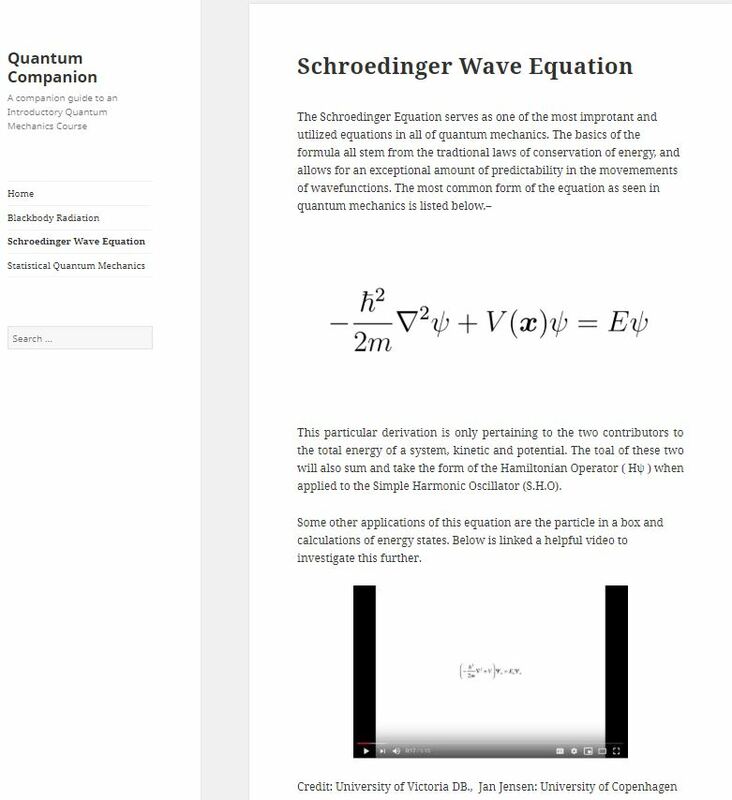 This entry was posted in Devon, QM and tagged Quantum Final Project on December 16, 2018 by dewilson.